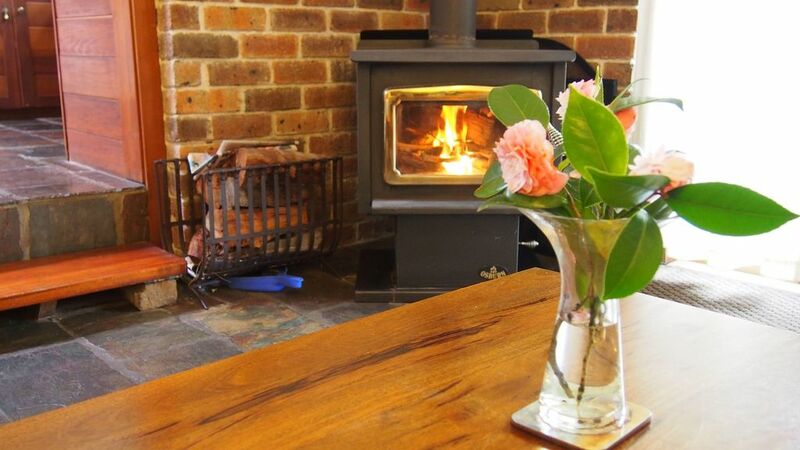 For your exclusive use Hampden Country Cottage, circa 1890 accommodation is unique. This charming luxury Cottage is beautifully restored, keeping a lot of its original old world country feel with all the luxury modern conveniences we expect today. No comfort has been overlooked for 2 - 4 adults or a family of five. Sitting on over two acres and adjacent to the Kangaroo River nature reserve, the Cottage is within an easy walk to the village. Quality cotton linen and fluffy towels supplied, tea and fresh plunger coffee. country breakfast basket, cheese platter and wine on request, please see rates page. Relax in the large deep two person spa with picture windows opening onto the cottage garden and it's abundant bird life. quality bed linen, additional single day bed available if needed for a small child. A special private place for a romantic getaway or to share with friends. maintained to a high standard. Let nature greet you in many ways at this special cottage and with adjoining nature reserve, from our wild life visitors in the garden to the wonderful variety of native birds in the surrounding woodland and garden. As evening sets in indulge yourself in the large two person spa bath, then cosy up in front of the wood fire. The cottage has a good range of books, DVDs and games to entertain. Rates: Weekend and holiday time. minimum two night stay. $275 two guests per night. $325 four guests per night. Breakfast basket can be supplied on request. platter can be arranged with cottage warmed for late arrivals. Kangaroo Valley Market Day 2nd Saturday of each month. Berry Market Day 1st Sunday of each month. Thank you for a wonderful & relaxing stay. The cottage is charming; you have created a beautiful and inspiring space that is so lovingly maintained. Our stay has been perfect and we cannot wait to return. Delightful cottage. Very restful, peaceful ambiance. Loved the wrens and robin flitting among the bushes on the back patio. Enjoyed reading the 60's & 70's mags and recalling the fashions. Friendly chickens from next door came to visit. Very relaxing. We had a wonderful relaxing stay - the cottage is lovely and the bird life amazing, we had a visit from the kangaroos and an echidna at the bottom of the garden and so many butterflies. A great weekend, wish we had booked for longer. We will return. Great to be back, feeds the soul! Are we attached to your cottage? Definitely!! Far exceeded our expectations. What a huge, comfy cottage. Perfect merger of old meets new. Just loved it. Thank you so much. Will definitely be back. stunning and the people memorable. Our week here has been perfect. Your cottage is beautifully kept. into the village where you will find the Friendly Inn, restaurants and shops, or a great cafe for morning brunch. Kangaroo valley is an ideal base for day trips, be it to the beach and south coast for a spot of dolphin or whale watching, or to the southern highlands on a wine tasting adventure. Just 2 hours from Sydney or Canberra. A great spot to have a weekend or midweek break, there is plenty to see and do in Kangaroo Valley and surrounds. An Excellent and comfortable base for touring the South Coast and Southern Highlands of N.S.W. For overseas visitors we have a wonderful wild life self guided tour by kayak or canoe. complimentary bikes for their stay. Must be booked prior to your stay. Or take a look at their canoe and kayak trips on the Kangaroo River. village. We can help arrange activities for you. toilet, combination tub/shower, Large spa bath, seperate walk in shower. Bicycles are provided for guests. Please ask host if you require them during your stay. Lovely place would definitely go back. This is a lovely place to stay. It's a beautiful cottage in a lovely area. The cottage is really very well appointed with anything and everything you could need for a self catered stay. It is a charming house, very comfortable and exceptionally clean. We had a lovely two night stay and did not want to leave. Would highly recommend this cottage for a relaxing and well equipped break. Access was so simple and our hosts very happy to communicate before, during and after. Lovely country cottage. Perfect for what we were after. Thank you for looking after us. Great to hear you enjoyed your stay at the cottage. Lovely cottage. Very tastefully decorated. What a pleasant surprise we were in for when we opened the front door to Hampden Cottage. Clear directions for driving from Sydney were emailed to us by Jenny so our arrival was 'a breeze' and stress free.!! The cottage is soooo roomy and it was great to have 2 living rooms and of course 2 toilets. No details had been spared even to firelighters for the fire placed in envelopes . .The shampoo was the BEST I have EVER used. In the pantry were a few condiments to help with the cooking. Beds were VERY comfortable and it was great to be able to park the car at the back of the property behind a gate. As for cleanliness - A++++.The cleaner popped in as did Jenny just to check we were completely satisfied with everything- a nice touch!! Thank you so much for your lovely review Barbara. It is always special to have appreciative guests stay at the cottage. Bikes available for guests on request. Kangaroo Valley Safaris will help with all your requirements.